For a few weekends in February or March each year, Italy sees deep-fried pastries produced in droves, giant papier-mâché floats parading through towns, and a whole lot of confetti. These are all ways in which Italy celebrates Carnival, or Carnevale in Italian, before the beginning of Lent. The name derives from the Latin, carnem levare, meaning to eliminate meat. As such, Carnival is the last chance to indulge in food, festivities, and a fair few illicit activities before the period of abstinence and sobriety during Lent. While some traditions like masked gambling in Venice are no longer part of the festivities, several cities around Italy still go all out with their pre-Lent extravagance. 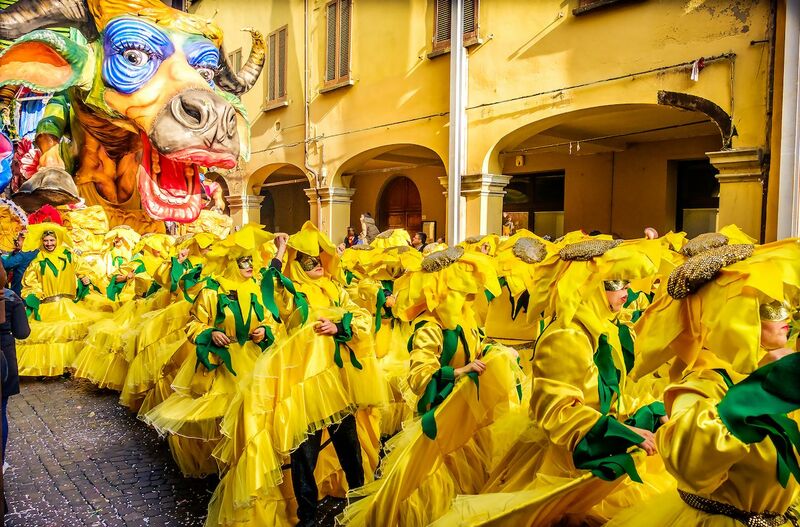 Here are some of the best Carnival festivals in Italy, including a fight with oranges, enormous mechanized papier-mâché politicians, and a flying angel. Though it likely has older origins, the Carnival of Cento really took off in the ‘80s and ‘90s, and its subsequent twinning with the Rio de Janeiro Carnival rocketed it to international fame. Following the traditional Carnival model, Cento’s pièce de résistance is its parade of giant papier-mâché floats. Each of the five Carnival Societies is responsible for creating a float, many of which play on current news issues (Donald Trump with chimp friends made an appearance one year). These all-singing, all-dancing masterpieces have moving parts and confetti cannons, and carry costumed dancers and performers. The highlight for children visiting the Carnival is the gettito, the moment when the performers on the floats begin throwing free gifts and hundreds of sweets into the crowd. Cento’s festivities also include visiting dancers from Rio and a surprise celebrity appearance. Visit on the last Sunday of Carnival for the climax of the festival, when the winning float is announced and a bonfire where the typical carnival mask is burnt (according to tradition) occurs. All this is followed by a firework display. Dates: Parades take place on February 10 and 17, and March 3 and 10. 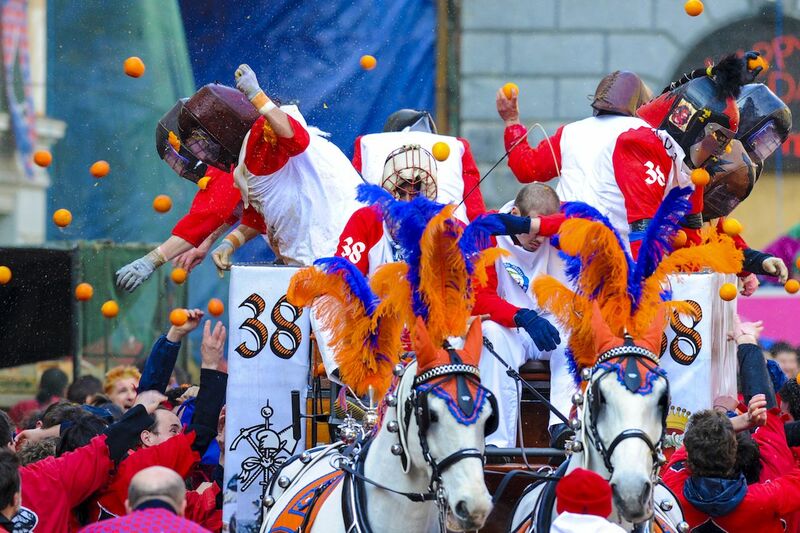 Over the centuries, various quirky traditions have become incorporated into Carnival festivities, but none is more intriguing than Ivrea’s Battle of the Oranges. For three days, a battle rages throughout the streets and squares of Ivrea’s old town, with several hundreds of tons of oranges used as ammunition. The battle is fought between soldiers of a medieval tyrant riding in horse-drawn carriages and rebels on the ground. Legend has it that it commemorates the overthrowing of a tyrant by the people of the town, after the milliner’s daughter chopped off his head when he attempted to exercise his droit du seigneur. It’s a violent and messy affair, and it makes for an exhilarating afternoon cheering on the rebels while dodging flying oranges. Don’t forget to join the bruised and battered soldiers after the fight as they congregate in bars covered floor-to-ceiling in newspaper and cardboard in an attempt to protect against the invasion of orange pulp. Celebrations continue well into the night. During the weekends leading up to the battle, there are also historical processions and traditional food stalls. To try a special Carnival dish, stop by the Bean Feast for an early morning bowl of steaming, hot beans. Viareggio is Italy’s most revered Carnival, and it takes its celebrations so seriously that it has created a “Citadel,” or carnival town, with vast warehouses where the floats are constructed, a Carnival museum, and a central elliptical arena that now hosts concerts and events. During the month of Carnival, the whole town is infected with carnival fever. Popular bars and restaurants host fancy dress parties, traveling theatre groups give performances, and folk music, food stalls, and mask vendors are in abundance. The highlight of the event, however, is the parade of papier-mâché floats along the seaside avenue. There are no barriers, so performers mix in with the crowd and you can get right up close to the floats, many of which play on allegorical and satirical themes. Dates: Parades take place on February 9, 17, and March 3 and 5. 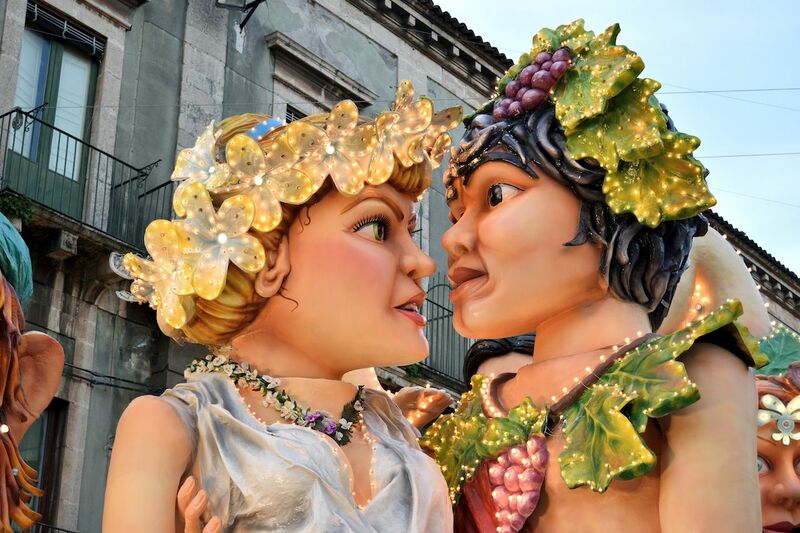 The Sicilian Baroque town of Acireale can claim Carnival origins as old as the 16th century. Its earliest celebrations, however, were soon banned as they involved tossing rotten eggs and citrus fruits at people in the streets. Luckily, the 19th and 20th centuries saw the development of horse-drawn carriages parading through the streets, which evolved into the papier-mâché floats seen today. Highly ornate, and often quite satirical, Acireale’s illuminated float creations are real works of art, with an extraordinary amount of detail. 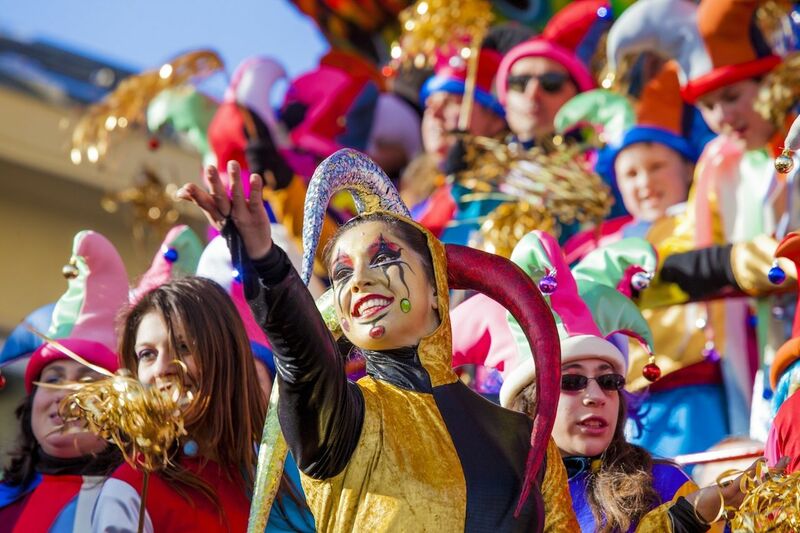 Indeed, Acireale is widely considered the most beautiful of Italy’s Carnival celebrations. The parade also features a special flower-adorned float, which is the winner of the preceding springtime Carnevale dei Fiori, another event that shouldn’t be missed. Alongside the fantastical parades, there are acrobatic displays, buskers, DJ sets, and dance shows. Internationally renowned Venice Carnival can easily be considered in a league of its own when it comes to pre-Lent celebrations. 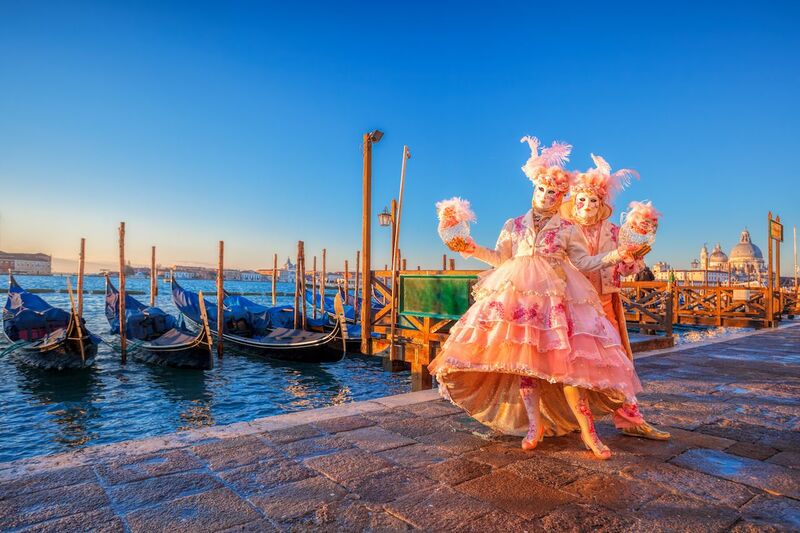 Indeed, if you want to experience some of that darker, secretive side of Carnival then you need to spend an evening in Venice, wandering from bar to bar through dimly lit streets traversed by shadowy, masked figures. During the day, there is a vast array of events, from the costume parades to the Flight of the Angel, when a beautiful woman flies across St Mark’s Square. Pop into some bakeries, too, to sample Carnival pastries which are nearly all deep fried. But make sure you stay on into the evening, don a mask, and follow the trail of confetti out of St. Mark’s Square and into the quieter areas of the city. Just as in the old days, Venice Carnival is the chance to become anonymous and lose yourself in the crowd of revelers. Comacchio is another aquatic city a little south of Venice, and it uses its waterways as the location for its carnival parade. The decorative themes of the parading boats remain a secret until the first weekend of Carnival, but previous years have included everything from Minions to Greek gods. 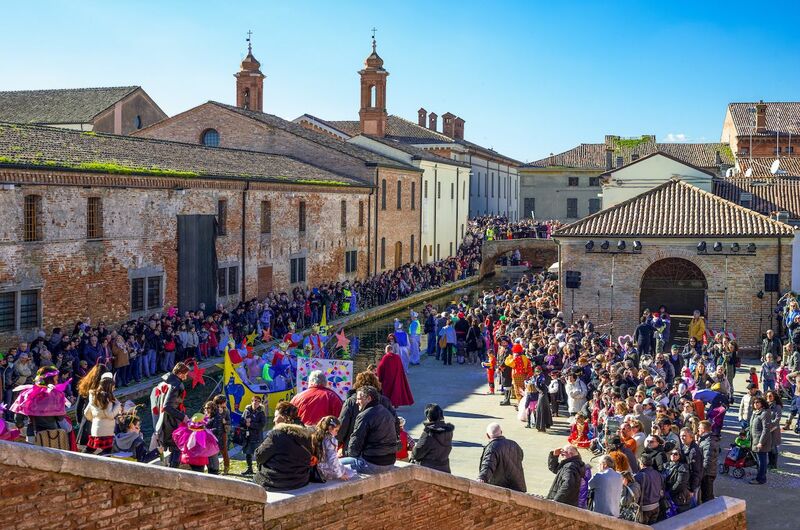 The best place to watch the parade passing is from Comacchio’s iconic Trepponti, or three bridges, which is a kind of bridge crossroads where four different canals meet. This is a more local celebration on a smaller scale, but that shouldn’t put you off. It’s a real family affair, with children dressed up and receiving little gifts from the Carnival King, and it’s not overrun with tourists like Venice Carnival. To really get involved in the celebrations, make sure you arm yourself with a bag of coriandoli, or confetti in English, to throw at unsuspecting victims. Dates: Parades take place on February 24 and March 3.